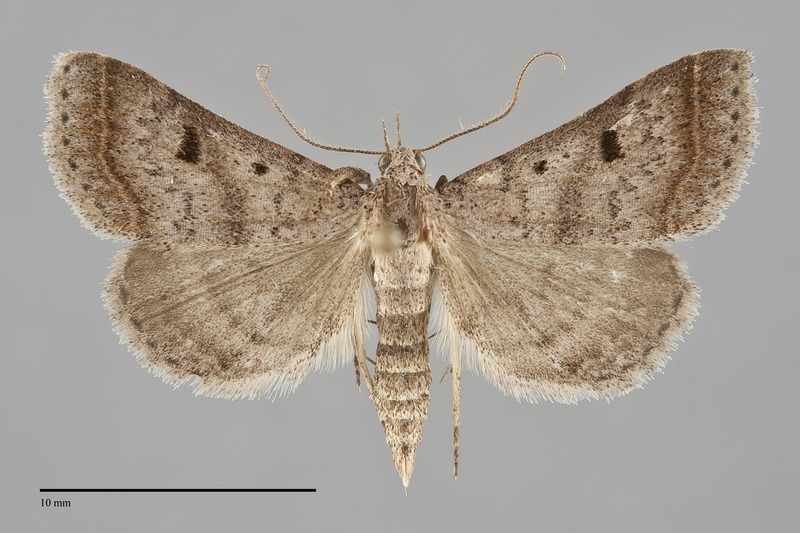 Bleptina caradrinalis has relatively long wings for a member of the subfamily Herminiinae. The costal margin is slightly concave giving the appearance that the wing curves forward. It is a small to medium size moth (FW length 12–15 mm) with bluish gray to light brown gray forewing ground color. The costa and distal wing surrounding the pale subterminal line are darker gray. The antemedial line is sinuous and fairly faint. The postmedial line is variable, often dentate but sometimes smooth, convex toward the outer margin near the reniform spot. The median line is usually prominent but ill-defined. The subterminal line is ochre yellow and very smooth, undulating near the posterior margin with the anterior two-thirds straight to the costa. The orbicular is a small dot, while the reniform spot is moderate size. Both spots have a similar appearance, either similar to the adjacent lines or jet black. The reniform spot is filled with ochre or burn orange is some individuals. 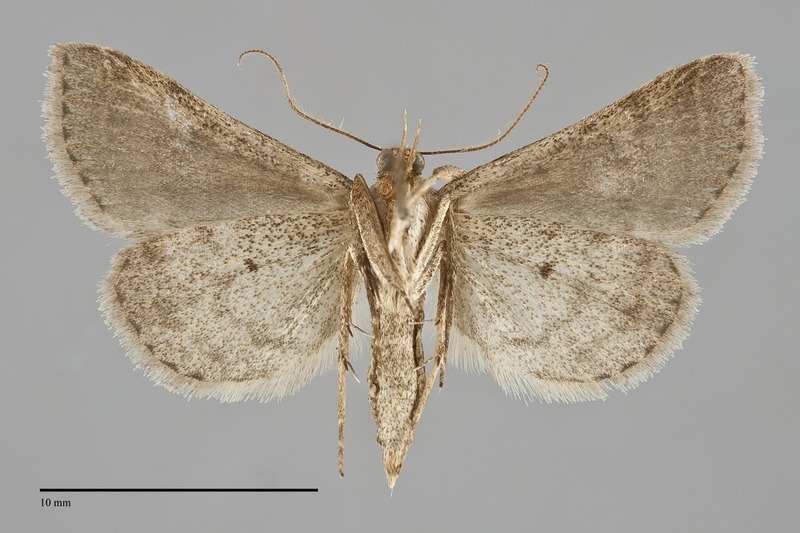 The hindwing is light to medium gray with darker median and postmedial lines and a light subterminal line. The palpi are long and curved over the head. The male antenna is ciliate without a node; that of the female is simple. This species can be recognize by its elongate blue-gray wings and smooth yellowish subterminal line. This species is common and widely distributed across North America. It is also common to abundant in forest habitats throughout the Pacific Northwest, and is probably the most common species of detritivore in all forest habitats. Bleptina caradrinalis is widely distributed in mesic forests in our region. It is found in southern British Columbia and western Oregon and Washington. This species is widely distributed in North America. Covell (1984) states that it is common throughout the East. Bleptina caradrinalis is a detritivore feeding on the dead leaves of many plants. Adults fly in the summer and have been collected from mid June to early August in the Pacific Northwest. It is nocturnal and comes to light.